Today I would like you tell you about my newest art piece - "The Sacred Unicorn”. In nowadays artworks and illustrations unicorns are nothing more than just a beautiful magical horse with a sharp horn poking out of their heads. The culture made a unicorn something connected to the rainbow, girly colours and I must say this is quite far away from where I my inspiration came from. The waves of my inspiration came to my mind from much more ancient mythical stories, ancient times, medieval murals and other truly enchanting sources. The unicorn character existed in art, stories, books, fairytales, architecture and scriptures of many different nations. It is widely believed that the actual form of a unicorn in the fairytales could have come from a real creature that could have lived long ago, same as we have rhinos and antelopes now. They are also sharing the same bodily features, having horns growing right out of their heads. Everything is possible, especially in artist's imagination and heart. But let’s come back to something we can prove by official sources such as history and mythology, which has influenced this piece quite a lot, too. Unicorn is classed as a mythological creature that symbolises chastity, spiritual purity and wondering in the wide spectrum of these words. Usually they are pictured as smaller sized horse type of animal with a sharp and long pointy horn coming right out of their forehead. In Medieval stories only the most special witches and wizards could have had a chance to ride one of these creatures. A unicorn was classed as very unusual, quite a worrier type animal, not very placid, but more obstinate and unapproachable creature that would kill anyone who would mess about with him. For the same reason of being unapproachable and having the inner purity, the unicorn could have been tamed only by a pure Virgin with an innocent heart. He would only trust his heart and body to her, would let her pet him and would then calm down his obstinate nature and fall asleep, by putting his head on her lap. Then the pure virgin would be able to place a magical golden bridle on his head and from that moment he would be her’s forever. 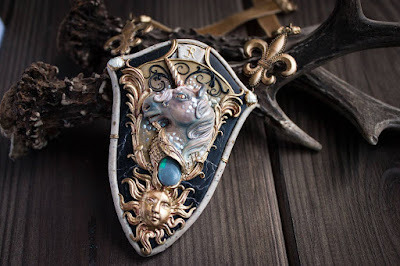 When making this necklace, the most of my inspiration came from medieval murals and heraldic forms. 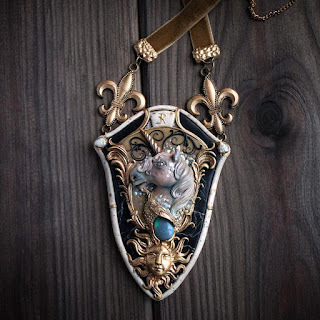 In heraldry the unicorn is a symbol of caution, careful approach, wisdom, purity, virginity, strictness and hardness as well as the most important unicorn’s quality - holiness. This is one of the reasons why this symbol could be very often found on icons of many saints including the Virgin Mary. Although some other metaphorical explanations for the unicorn’s meaning, that was found on the shield of a medieval warrior. It says “They drop down from the sword of the brave man like the poison drops from the unicorn's horn”. In both interpretations the unicorn was always pictured as a small horse with the long spiral horn and a small goaty beard. That is where the beard inspiration comes in my art piece and it’s not accidental. The color palette is quite simple, although every colour has it’s purpose and was thought off thoroughly. Just like in the ancient murals, the robes of the rich and handmade royal wall carpets, the combination of black and gold colors is a symbol of calamity, purity and royalty. The black colour lets you deeply immerse into it and tunes you towards acceptance and calm mood, while the golden floral motives are dancing and swirling in illusion of the contradicting beauty and simplicity. In this combination you can see the whole spectrum of emotions and the mixture of contrasts. The necklace is decorated with a milky opal for a reason. Opal crystal is usually recommended to those who needs to concentrate all of their energy in achieving a goal. It is also believed that the Opal can develop a gift of prediction in it’s owner. Eastern civilisations are calling the opal to be a symbol of purity and fidelity, which is also a perfect match for the Unicorn theme of this jewelry piece. When making this necklace I tried to not get attached to any time period or story, but instead merge many different stories into one, many different elements from different times and ages to create a symbiosis of the most wonderful facts and visual expressions when it comes to the unicorn theme. I hope I managed to do just that.